Working with a checkbox in Angular is very similar to working with a radio button. 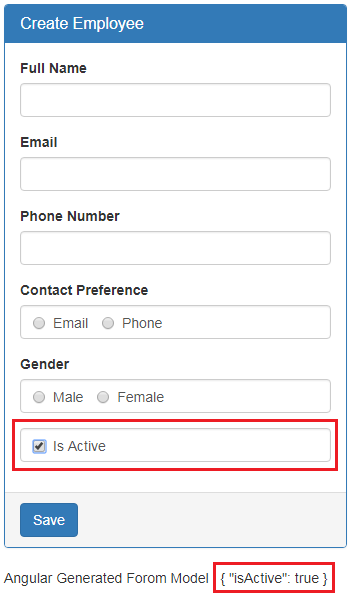 We want to include "Is Active" checkbox in the Create Employee form as shown below. When we check the checkbox, "isActive" property should reflect in the Angular generated for model as shown in the image below. Also, when we click the "Save" button we want the "isActive" property value to be logged to the console. If we include "checked" attribute on a checkbox, we expect checkbox to be checked by default when the form initially loads. But you will discover that is not the case. However, if you remove the "ngModel" directive from the checbox, then it gets checked as expected. Notice the "ngModel" directive is removed from the checkbox. With Angular Template Driven forms, we use "ngModel" directive for two-way data binding. So the moment we put it back in place the "checked" attribute does not work. To make it work include "isActive" property in the component class and initialise it to true. At this point you will have "Is Active" checkbox checked by default when the form loads. Now, even if we remove the "checked" attribute from the checkbox it is still checked by default when the form loads. This is because of the two-way data binding that we get with "ngModel" directive. For our form we do not want the checkbox to be checked by default, so remove the "checked" attribute and the "isActive" property from the component class. Another important point to keep in mind. By default, disabled form controls are not included in the Angular auto generated form model. Since, the "Is Active" checkbox is disabled, it will not be included in the Angular generated form model. In our form, we do not want the checkbox to be disabled, so please remove the disabled attribute.